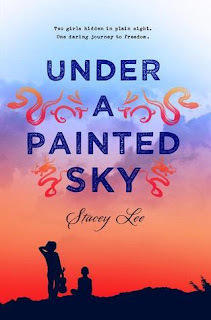 Partway through Under a Painted Sky, I realized that I had never read a western before. What a pleasure for an avid reader to find an entire genre that is missing from my experience! Not that I think this is a typical western. It follows Sammy, a Chinese teenager, who loses her father to tragedy and accidentally kills a man. She and a runaway slave, Andy, have to dress like boys to blend in with the many "Argonauts" who are heading west to seek their fortune. Chased by the law, they join up with a group of travelers and have a series of adventures and scrapes. I really enjoyed this book, especially for all the action that occurred. It held genuine surprises for me and some pleasant connections, too. If I learned anything in elementary school computer class, it's that someone always gets cholera on the Oregon Trail. I found that I was less interested in the scenes about horses stampeding (probably why I've never read a western), but taken in by the setting and what life was like on the trail. Most of all, I loved the friendships in the book. This reminded me so much of Copper Sun, which is a huge compliment because I think that is the pinnacle of YA historical fiction. There is a romance, sure, but the central relationship of the novel is between Sammy and Andy. I appreciate that message for teenage readers.